There are ferocious winds and rain predicted from lunchtime, so, despite 18 ‘severe’ miles and a very late finish last night, we get going earlier than normal. As our B&B host summarises: “My best advice to you today is to get going quickly and don’t hang around”. From the village of Worth Matravers it’s a quick 1.25 miles down a stony track to rejoin the South West Coastal Path at Winspit. As we head East towards our final destination, we are glad that we inadvertently did more miles than planned the day before; during the evening, the views had been bathed in gorgeous warm autumnal sunlight, but today we have relentless dull, grey skies. It’s easy stomping along the low cliffs, punctuated by disused quarries, and we make swift progress – despite the claggy mud weighing us down in places – past the quirkily named Dancing Ledge and Blackers Hole to the lighthouse at Anvil Point. Just round the headland are the Tilly Whim Caves, named because the quarried Purbeck stone was lowered by early cranes known as ‘whims’ into waiting boats. Part of the Durlaston Estate, the path from the caves becomes more manicured and we begin to pass growing numbers of young families and people out for a Sunday day trip, rather than only occasional, determined ramblers. The path round Durlaston Bay takes us between houses before sending us onto the grassy slopes that lead to Pevril Point, from where the Coastal Path becomes a tarmacked descent into Swanage. There appears to be a festival of morris dancing underway, with different groups shaking their bells and clashing sticks at intervals along the seafront, so we decide to stop for coffee and cake – although we are not sure if later we will be grateful that we enjoyed a break while the weather was still holding off or regret that we didn’t push on to make progress before the storm arrived. Fortified, we follow the Coastal Path signs away from the seafront, through rows of bungalows and up a gentle ascent along Ballard Cliff to Old Harry’s Rocks, chalk cliffs and stacks. As we’re making the easy stomp towards Studland, the promised rain arrives. Although not too strong at first, by the time we are a third of the way along the flat sands of Studland Beach, decorated with mounds of seaweed, fierce winds are whipping up the sand around our feet and driving the rain into our backs. As the rain begins to drip from our hoods, our consolation is that we are not walking into it. By the time we arrive at the end of the Coastal Path at South Haven Point at 3pm, we are saturated, with sand stuck to our clothes and skin. But we have made it: 93 miles in 6.5 days of walking. And we are only a ferry ride and a bus journey from a hot shower and a cup of tea. And that is the end of my final challenge before launching #50challenges on 5th November. The week away has enabled me to get in practise for the final section of the South West Coastal Path, which we will undertake next September as one of the challenges that I will complete in my first year of my decade of completing 50 challenges; challenges that will be a balance between hard – such as the South West Coastal Path – mentally enriching and physically stimulating, as well as challenges that simply take me out of my comfort zone. The week has also given me time to think about #50challenges, and how we promote it to help inspire, support and celebrate other people facing this milestone, so they can get the most of their mid life and Do More, Achieve More, Be More. The Coastal Path between Lulworth Cove and Worth Matravers is graded ‘severe’; by the end of the day, we know why. Rain is predicted from midday so we want to make a swift start, but trying to get out of Lulworth proves easier said than done. We walk from our B&B in West Lulworth back down towards the cove to pick up the path a quarter of a mile before the Lulworth Crumple Stair Hole, with caves under the exposed striated rocks, which a group of teenagers clambers up and jump from, shrieking before they hit the water. Another quarter of a mile takes us down to the cove, which is dazzling turquoise in the mid-morning sun. We follow the signs back up the road, before thinking that we have gone too far and walking back down again. The guide book tells us there are steps up from the cove, but we can’t find them. After much searching, we realise they have been blocked off due to cliff erosion; the diversion signs that we had passed earlier now make sense. There is an option to walk along the beach, but the waves are lapping up to the cliff edge of the nearest section and we don’t fancy walking in wet boots for the day, so head back up the road again to pick up the Coastal Path diversion signs. By the time we have rejoined the proper path high above the cove, it is nearly 11am – so much for our early start. Our consolation is that the Cove looks stunning, the waters inviting blues and greens. The waters continue to entice as we enter the Ministry of Defence land that is only accessible at weekends and during school holidays and which will form the majority of the day’s walk. We walk through a Fossil Forest (although don’t see any) and round to the first of the day’s severe ascents, Brandon Hill, yielding stunning views inland towards Lulworth Castle, from where the sounds of Bestival reach us. The day and the views remain glorious as we climb up and down to Warbarrow Tout and round to Gad Cliff. Every climb gives us views of the festival – and the impending grey clouds, which finally unleash their rain as we approach Tyneham Cap. As we begin the descent towards Kimmeridge Bay with its black rocks and cliffs, the fierce rain is accompanied by thunder and lightning. We knew that this stretch of the path was unlikely to offer anywhere for refreshments, but given the weather, we optimistically scan Kimmeridge for somewhere to sit it out for a bit; there is no-where so we opt to push on, even though we are both hungry. Fortunately, as we climb the hill out of the bay the rain eases; even better, The Landmark Trust are holding an open day at Cavell Tower, a four-storey folly that is normally rented out as a holiday let. There is a platform round the tower which is shielded from the worst of the weather by a balcony above, so we opt to sit on the balcony to eat our lunch as the only dry area we are likely to find to sit on. We have just started sipping our soup when the next onslaught starts; it is then that we discover that the protective balcony has gaps in it, which allow water to cascade down on us. We grab our stuff and huddle in a doorway eating the rest of our lunch. The rain eases enough and allows the sun to break through to create a rainbow so low that it hangs over the fields. The kind people from the Landmark Trust refill our water bottle and we continue along the severe stretch of coastline, now made even more arduous by the rain; the claggy black mud clings to our boots so our feet are more the size if a shire horse and we need to dig two walking sticks in deep to stop us slipping downhill and sliding backwards when we should be climbing. At one point I slip backwards so violently I think I am about to pull a muscle, and all I can think is that I can’t let that happen as I have a marathon to run in six weeks. There is a final down pour at 4.45, which arrives with blue skies behind it. The weather forecast had said the rain would last from 12-4pm; at exactly 4pm, the rain overtakes us and we are bathed in sunlight again, but the cloying mud and our wet clothes and packs make the ‘severe’ walking even tougher. The guide book has promised one more tough ascent before we reach the village of Worth Matravers; by the time we reach the top of Houns-tout Cliff, I am feeling defeated. It must be written across my face, because a family who had been enjoying the view from the top vacate the only bench for us. Worth Matravers is a mile inland, with a choice of footpaths leading to it; the shortest route is another 2+ miles, the longest is about five more, but would reduce our time walking on our final day, which is predicted to have even worse weather. After some tea and an emergency bar of chocolate, we agree it will be prudent, given how hard the walk has been, to cut our losses for the day and take the shortest option. Unfortunately, the footpath we want is confusingly signposted to another village; we have gone about a quarter of a mile beyond it before we realise our mistake. At this point, the path has relaxed into an easy cliff-top stroll and the evening sun is delightful, so we opt to push on rather than retracing our steps. Unfortunately, the easy stroll is soon superseded by another steep valley, which saps the last of our energy. Back up on the cliff top, we round St Aldhelm’s Head, with its ancient chapel, and finally lose sight of the Island of Portland. The final two miles round the headland and up the valley from Winspit to Worth Matravers are comparatively easy going, but by now my blistered feet are hurting with every step and I rely on my sticks to help push me forward. There is a final reward from the weather with amazing sunset clouds when we turn to look back towards Winspit, but the last push towards the village seems relentless. It is nearly 8pm by the time we reach our B&B. Our hosts offer to make us a cup of tea, but we are so tired we want to get to the village pub before we lose the energy to go out and get some food. We change out of our wet, mud-sodden trousers and boots and go straight back down the hill to The Square and Compass. It is a pub like no other I have ever been in, and at odds with the Farrow and Ball exteriors of the stone houses. The door opens onto a narrow, poorly lit corridor that takes you straight to the bar, which is no more than a door, around which the staff emerge to take orders and then disappear to fulfil them. There are a dozen local beers, but only two food options: steak pasty or a slab of cheese and veg pie, served on paper plates. Another narrow corridor runs in two directions away from the serving hatch, we turn left and come across a crowded room with two free seats at one of three large tables. The room is painted in a variety of shades or burnt orange, with the woodwork haphazardly varnished. There is barely enough light to see our food, but we attack it ravenously: the cheese and veg slab is the most delicious pie I have ever eaten, zinging with layers of spicy seasoning. I begin to feel better as it warms me. The crowd around the table departs and a new wave filters in, filling all the stools, commandeering more, until the room is heaving. People arrive in twos and threes of different ages, some in their twenties, some retired, but they all appear to know one another. Coats are passed across the table to be piled on a stuffed badger in the window. The atmosphere is of a ramshackle student party. And then the singing starts. It is kicked off by an older gentleman sitting next to me in a clear, unfaltering voice; everyone joins in the chorus. Then a younger man sitting in the fireplace takes the lead, then someone behind us, then a woman. One man plays a guitar, but mostly the songs are unaccompanied apart from hands and feet keeping time. Most of the songs are known to the crowd, but occasionally someone comes up with a new offering. There are a lot of miners’ songs and a few about class struggle, interspersed with folk ditties and rumbustuous singalongs. We had planned to go straight back after eating to shower and collapse in bed, but the craic (there is no other word for it) is so good that we buy more drinks and stay for a couple of hours. They’re closing down the old pubs. “At least we’ve still got this old pub,” someone mutters after the final chorus is sung. I am not optimistic about the Island of Portland. Its flat cliffs have looked grey and uninspiring rising ahead of us as we neared Wyke Regis, and the Ordnance Survey map shows denser population around (largely abandoned) quarries. But to complete the South West Coastal Path in its entirety, we have to navigate its circumference. I fear it is one of the very rare sections of the SWCP that I won’t particularly enjoy. The first hour is absorbed by trekking back down to the Coastal Path and then east to the end of Chesil Bank to Ferrybridge, which is followed by a long, straight road – the one route on and off the island. The only remarkable element of this stretch is the dawning realisation of the vastness of Portland Harbour; it’s no wonder it provided the venue for the sailing events of the 2012 Olympics. We follow the guide book’s advice to walk clockwise round the island, so that – for a change – the sea is on our left. This takes us through the modernised Ocean Quay, past Henry VIII’s Portland Castle and up around the outskirts of the forbidding Verne Prison, built in the 19th century as an army barracks against French pretensions. The path is unpromising as it passes tall wire fences protecting quarries for the famous white Portland stone, but a steep descent brings the sea back into view while also bringing the cliffs into imposing perspective. A gentle, consistent climb takes us to the remains of Rufus Castle, with a fabulous spiralling sculpture in the ground, and the delightful Church Ope Cove. A short climb puts us back on the cliff tops for an easy trek to the southernmost tip, Portland Bill. The wind picks up considerably as we near the headland, as do the currents; the water is noticeably choppier as it meets in front of the lighthouses. After a cup of tea, we resume the easy cliff-top walk, past the houses of Southwell and Weston and more quarries until we come to a forbidding path diversion notice. On reading the detail though, it says that the path is to be closed for 15 days from the date of the notice – two years ago. We decide it is therefore safe and plough on. We make the same decision over the next closed section, only to discover the path come to an abrupt end where some of the cliffs have been chiselled away. We follow tracks made by other walkers who have clearly made the same mistake as us, and clamber over rocks looking for a shortcut back to the diversion. Catherine thinks she has found it when I point to an ornate rock carving below us, that looks like a formal Elizabethan garden oddly transplanted among the rough boulders all around. We are intrigued and perplexed by it, when a passing couple explain that we have stumbled into a sculpture park in a disused quarry. We explore some of the other sculptures as we weave our way out of the park to pick up the coastal path towards Chiswell and back towards Ferrybridge, with the impressive sweep of Chesil Beach arcing before us. By the time we have walked back to our B&B in Wyke Regis, we have clocked up 14 or so miles – 14 miles that I thought would be tedious ones to tick off, rather than enjoy. The Island of Portland has surprised me – in a good way; it has more variety and native beauty than the Ordnance Survey map suggests. We round off a surprisingly enjoyable day with dinner at the Crab House Café, a restaurant with a reputation that has spread far beyond this corner of Dorset. As I am allergic to shellfish, I had dismissed it, but Catherine’s husband has looked up the menu and messaged to say that they have fish dishes without shellfish. I am glad he persevered in persuading us to eat there; all I can say is, if you are in the area, make sure you book a table, because you are unlikely to get in if you don’t – and you will be missing out. The walk East from West Bexington is one of the few stretches of the South West Coastal Path that is largely inland. Although the first 2.5 miles are along the back of Chesil Bank, for conservation reasons at the start of Fleet Lagoon walkers are directed inland around the outskirts of Abbotsbury. The countryside is beautiful – England’s green and pleasant at its best – but it seems strange not to hear the rhythmic crashing of waves which has accompanied us for nearly 500 miles. Descending to the banks of Fleet Lagoon provides some compensation; it’s a vital nature conservation site that has its own beauty, dominated by the relentless shingle hill of Chesil Beach along the 29km of its southern edge. It’s a noticeably hotter day and a couple of miles short of our destination we finish the last of our drinks; we didn’t expect to run out of fluids in September. However, we only have an hour’s more walking and – hugging the coast of the Lagoon – it is all flat. We arrive at our B&B a quarter of a mile from the Path in Wyke Regis feeling positively spritely compared to the state in which we have sometimes finished our walks; 14 miles on the flat feels like a saunter in the park compared to some of the terrain we have covered. A plaque in the hall reveals that our hosts at Swallows Rest are winners of Channel 4’s Four In A Bed; the fresh meringues on arrival and fresh cake in our bedroom are one of the many winning touches that we enjoy during our two nights being looked after by Jane and Keith. There is a Coastal Path sign directly outside the pub where we have stayed the night, pointing up the hill inland, but we decide to ignore it so we can wander along Lyme Regis sea front; our idea was to be able to explore this resort made famous by literature, rather than ploughing straight through it. So we spend a bit of time meandering along the front, taking in the famous Cobb, before heading up the steep High Street to buy supplies, then back down again to pick up the path that will take us to tonight’s destination: West Bexington. Coastal erosion means we start with a significant detour inland to Charmouth; inland inevitably means uphill. The promised rain arrives, but with persistent humidity we persevere in shirt sleeves, even though everyone we pass is huddled in protective layers. Allegedly we are back down by the sea within two miles, but we are sure we miss a turning and add on significant extra steps within some woods, because it feels much more like three miles. But eventually we are back on the undulations of the Coastal Path proper, with the sea to the right of us and – thankfully – dry skies, although the persistent humidity makes the going tougher than it would otherwise be. The rise and fall of Cain’s Folly and Broom Cliff give way to the tougher challenge of Golden Cap, with a steep flight of steps for the final ascent; there are probably spectacular views from the top, but the low cloud means we can see nothing. From the Cap it is a gentle descent down to Seatown, where we have a welcome cup of tea from the surprisingly well-stocked shop of the holiday park before continuing the three miles over Ridge Cliff, Doghouse Hill and Thorncombe Beacon, through Eype Mouth and over West Cliff to West Bay, where we finally stop on the beach for a late lunch (3.30pm). Today is our longest walk of the week, so we face another 6ish miles once we haul our rucksacks back on. From West Bay it’s a simple walk along the cliffs, passing in front of Burton Bradstock, before descending down to Burton Beach, which morphs into Hive Beach and then Cogden Beach. This should be easy, flat walking; some of it is, on grassy footpaths and tarmac trails behind the beaches, but in some areas the storms last year threw shingle across the path, making the going very hard work. The final mile or so seems like an intense work out, rather than a walk, with muscles being pushed and pulled in unfamiliar directions as we slide on the pea-sized pebbles. As we arrive at West Bexington at nearly 7pm, the sun finally breaks through the clouds, shimmering on the grey water. We face a steep climb up the road to our B&B; not sure what the options are for eating in the village – or, indeed, if there are any – we call the owners of our B&B to say we are going to eat at a beachside cafe and will be arriving late. They insist instead on driving down the hill to pick us up and transport us straight to their preferred pub for a drink and supper. It’s service such as we have never had before. Elizabeth and Tony of Sea Fret, West Bexington, go straight to the top of our leader board of best B&B owners. We didn’t set out to walk the entire South West Coastal Path. Originally it was a one-off holiday – a chance for two mums to have a break from their families for the first time in more than a decade. My idea was that we would collapse on a beach; Catherine suggested it would be nice to stretch our legs – to do the kind of walking that we hadn’t been able to do since becoming mothers. Through a process of elimination and narrowing down which bits of the beautiful English countryside we would most like to explore, we decided to walk the second stretch of the South West Coastal Path, from Westward Ho to Rock. It was only going to be a one-off, but we loved it so much – and felt so energised by our week blowing the cobwebs away – that we resolved to make it an annual event. The logistics have got easier: the children are older so we no longer have to micromanage for our absences. The walking has got slightly harder: there are aches and twinges that we didn’t have seven years ago; Catherine is not sure how long her knees will allow her to continue arduous walking, and I am battling with the remains of an ankle injury that has plagued me for 18 months. But we have done 450 of the 630 miles, and are determined to finish the rest. So this is my final challenge before #50challenges: the penultimate section of the South West Coastal Path – 93 miles in 6.5 days from Seaton in Devon to the end of the path at Poole in Dorset. Yes – the end of the path. This should really be the end of the walk for us, but as we started on Week 2 of the eight-week walk, next year we have to go back and finish the first section. That will be one of my first year’s challenges in my decade of #50Challenges. But, for now, I am still 49 and counting this as my final warm-up before I launch #50Challenges on the 5 November, the day after my 50th birthday. At 9.30 we meet at the train station for our annual pilgrimage, stuffed rucksacks on backs. For the first two years we took extra baggage, which we had transported to our next accommodation, but we soon calculated that if we only took what we really needed we could carry everything ourselves. We have it down to a fine art – miniatures of everything, bare essentials only. The plan is to arrive at Seaton by 3pm and walk the 7 miles to Lyme Regis, partly because we are trying to cram 7 days’ walking into 6 and partly because neither of us have been to Lyme Regis for years and would like to explore it, rather than simply stomping through it. It’s a good plan – that is utterly scuppered by GWR. Signalling failures, broken down trains and crews in the wrong places mean both the 11.20 and the 12.20 to Axminster are cancelled. Eventually, we are advised to get the first available train to Basingstoke and hope for a connection to Axminster. We arrive in Axminster two hours later than scheduled, with no bus connection available to Seaton. 10 phone calls to local taxi firms later and we finally get to the start of the walk in Seaton at 5.15pm. It will be dark by 8.30pm and we have 7 miles to walk with sizeable packs on our backs. We have learnt over the previous 6 years that – no matter what the terrain of the coastal path – we average 2 miles an hour over the course of a day. Even if we get a good stretch where we can pick the pace up, it will be balanced by an arduous section, so 2 miles is our rule of thumb. We know we have to keep up a good pace if we are to arrive in Lyme Regis before it is dark. The route is unlike any other section of the path that we have been on so far; apart from a field at the beginning which yields views of sea and sky, we follow a track through lush woodland, full of saturated ferns and twisted tree roots which, together with the recent heavy rains, make the path difficult to negotiate. There is much slipping and sliding – and one tumble – especially as it becomes increasingly gloomy under the trees in the failing light. We are relieved when the track finally opens out and we see Lyme Regis, with its famous Cobb, spreading out below, street lights already dancing on the water under the darkening skies. We weave our way down through public gardens to find The Cobb Arms, our home for the night, in prime location. We arrive at 8.20; they stop serving food at 8.30. We have made it – just. Like many ideas, 50 Challenges began with a question: what was I going to do for my 50th birthday? This was a good 18 months before the event, but my husband had celebrated his a couple of years before, and we were being invited to increasing numbers of parties to mark the big five-oh of friends, so it seemed a topical question. Most friends threw a big party; a few had a special holiday. Neither of these seemed adequate. My forties were not an easy decade: I was on medication that caused severe depression, the fog of which led me to make some poor decisions, which created additional strains. It was an extremely hard time personally, and a very hard time for my family; it’s not easy for young and growing children when their mother is there in person but absent in spirit. The medication/anti-depressants/both also caused me to put on weight, so I ended up at my lowest ebb, both mentally and physically. The turning point for me was a hysterectomy when I was 45; no longer needing the medication, I came off the anti-depressants and began rebuilding myself. Key to this – and almost an accident – I took up running; I ran the London marathon in April 2015 when I was 47, completing anther two marathons within the next 12 months. As I contemplated my 50th birthday, I felt stronger – mentally and physically – than at any other time of my life. This wasn’t a passing thought, but a conviction that grew the more I thought about it. I realised I was approaching my 50s from a position of strength – something that I would never have been able to envisage in the bleak years of my mid-forties. It was also something that seemed worth more than a party – however good it might be. I also realised that how I felt about myself as I approached mid/later life (you may not want to think of it that way, but however you do the maths, 50 is the later part of your life), bore no relation to the role models I had before me. As I thought back to my parents and their friends, and the parents of my friends, I could see little resemblance between me and my friends and the previous generations. When I was a teenager and in my early 20s, women approaching 50 seemed to buy their clothes from a dedicated shop called Frump; all the middle-aged mums I know today shop in the same stores as their teenage daughters, and there’s not a huge distinction between their wardrobes. My parents’ generation was also that of the early retirement packages. My father was one of thousands who quit big multi-nationals with a generous pay out in their early 50s; although my father continued to work well into his 70s, many of his peers took to the golf course and never worked again. Many of them may well have suspected that they would keel over by their mid-60s, as this was when their own parents had died, so their attitude was to enjoy life while they could. Contemplating 50 in 2017, the idea of stopping work completely – when I have more energy, stamina, knowledge, skills and drive than ever – seems counter-intuitive to the point of bewilderingly alien. And this, I think, is the nub. As we contemplate 50 in 2017, 2018, 2019… we are starting from a very different position from the generations who have gone before. As I look down the barrel of 50, I expect to have another good 40 years ahead of me; I accept that I’ll probably get dribbly and incoherent eventually, but I expect to be able to enjoy – in every sense of the word – the next 40 years. That’s a privilege that previous generations haven’t had. When I was in my teens, women in their late 40s didn’t take up endurance sports. When I was in my twenties, men approaching 50 didn’t invest in Lycra and start cycling furious miles every weekend. We are all approaching later life from a position of health never enjoyed by those who have gone before us. And the more I have talked to other people about it, the more common I believe it is that our generation is approaching later life from a position of great mental strength as well. My own situation is extreme – from the maximum dose of anti-depressants and unable to get out of bed to running marathons and my own business, as well as my home and family – but I know that it is not unique; I have talked to many people who have had extremely challenging times in their forties who say they feel mentally stronger than ever as they approach their 50th. So, 50 Challenges emerged from the idea that we have no blueprint for what 50 looks like; 50 today is so very different from 40, 30 or even 20 years ago, that we need to create our own model that reflects our position of strength. More than that, this model should ideally shape how we see our later life progressing: it sets the foundations for our 60s, 70s and 80s, because the role models we have for these decades are also obsolete. Of course there are those who are approaching 50 from a different position – possibly feeling slightly lost, not knowing what their identity is as they face their next chapters, particularly as their children become more independent. But they too also have another good 40 years ahead of them. So, whether you have emerged from your 40’s feeling stronger or questioning what the next chapter holds, it’s important for all of us to shape our own definition of how that chapter might unfold, because we can expect it to be a longer, healthier chapter than previous generations have enjoyed – we owe it to ourselves to make the most of it. If you can’t look ahead with clarity to that chapter, 50 Challenges is also there to help you define it on your own terms. 50 Challenges is exactly that. It’s not a bucket list – we are a long, long way from kicking the proverbial! It’s about facing mid and later life from a position of strength, it’s about redefining ourselves positively at a time of big life changes – and celebrating and tackling both of those by challenging yourself to do more, think more and be more than ever before. I’d love you to join me on the journey. 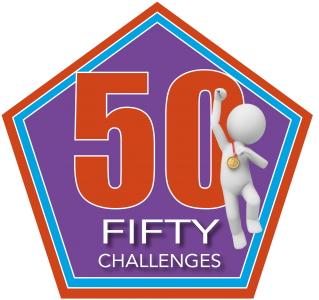 I am participating in 50 Challenges because setting goals has become even more of an integral part of my life since I suffered and survived a life threatening brain haemorrhage when aged 44. It has left me paralysed on one side and partially sighted; both of which mean that my daily life has had to adapt to accommodate these significant restrictions. But I’ve discovered that I’m a fighter and have drive, which has kept me moving forward at all times. Even in the darkest times I have been able to find the determination to continue my recovery by setting myself, at times, goals which might be intended to get myself through the next five minutes. I was an inpatient at a number of hospitals for over a year and had to rely on my own mental fortitude to keep myself feeling positive. I’m thankful for still being alive and for being at home again with my husband and children. 50 Challenges is about celebrating life, which is something that I do every day. My challenges are linked to what has happened to me, but also to what I’ve discovered about myself on my journey so far. My physical challenges are all linked to conquering my paralysis. My 50s will be a far better decade for me than my 40s. So what better way to start it than by setting myself a number of challenges which will help me to continue to enjoy my precious life and ensure it’s even more fulfilling each day.